Inside Under Armour's design process and creation of Andy Murray's custom shoe. Andy Murray hasn’t lost yet wearing Under Armour’s first-ever men’s tennis shoe, built specifically for and with the Scot. Murray captured the Queen’s Club title in the lead-up to Wimbledon wearing the Clutchfit Pursuit shoe and then secured a first-round victory at The All England Club on Tuesday. Under Armour vice president of footwear Josh Rattet likes the start. Murray signed with Under Armour in January of this year, but without a men’s tennis shoe in their brand, he wore UA apparel and kept playing in his Adidas shoes. Rattet says they did their best to change that as speedily has possible. From the outset, Murray’s desire was for a lightweight offering that didn’t drag him down, but still offered durability. “In the tennis world, you see a lot of heavy, orthopedic-type products with big pieces of plastic,” Rattet says, noting his past footwear was “heavy and stiff.” The Baltimore-based company wanted to change that, using their own proprietary fabric, textiles and constructions to put their stamp on his shoe. But the process was tricky, as UA designers were flying all over the world to keep up with Murray, showing him samples along the way. One designer made stops in Paris, Rome, Madrid, Barcelona and London within a span of a few weeks, working in trips to China with engineers to get more samples. The speedy process almost wrapped in time for Under Armour to release the Murray shoe ahead of the French Open, but Rattet says they needed just a touch more time to fully test it out, instead moving their focus to the grass court version he first wore in a competitive match at Queen’s Club. 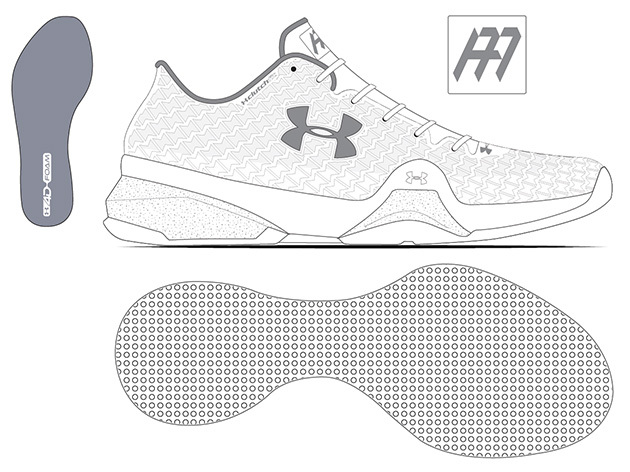 Around the shoe’s upper, Under Armour built up a foam sole for comfort and additional stability to support lateral movement. Getting to the final product quickly required designers to always offer Murray choices. “We had two or three options going simultaneously to ensure one would be perfect for him,” Rattet says. “We turned product in record time.” Even though UA has a top women’s player, Sloane Stephens, outfitted in their product, they built the Murray shoe from the ground up, with a “completely different platform” than what Stephens wears. Murray, who likes worn-in shoes, has multiple match-ready pairs at any given point and often works through up to four pairs a month. The launch of the Clutchfit Pursuit comes with a subtle touch to Murray’s style, using an “AM” logo on the tongue as the main call-out. But you can blame a bit of a subdued debut to the Wimbledon rules on color, which Rattet says they were happy to adhere to out of respect for history. That will all change in the hard court season and ahead of the U.S. Open, when Under Armour will show Murray’s personality, playing with patterns—camo is coming—and colors from toe to head. All this work to create a men’s tennis shoe isn’t about a men’s tennis shoe. It is about Murray. Rattet says UA’s designs are “born on court” and they first want to make sure Murray has all he needs before they start moving the shoe toward collegiate programs and eventually retail. The only way to see the Clutchfit Pursuit is for Murray to keep winning.